During 1902-1970, a number of gramophone companies produced thousands of records in 78-rpm format in India. Until about 1950, although The Gramophone Company had captured the Indian market, over one dozen companies were operative under British, German, French and Japanese collaborations. They produced largely 10” diameter 78 rpm black records made out of shellac [a mixture of slate dust mixed with lac]. At the center of these records a colorful label of about 4” diameter contained lot of information like catalogue and matrix number, song title, names of the singers, lyricist and the music director etc. Over 350 labels of different designs, colors and style have been found. 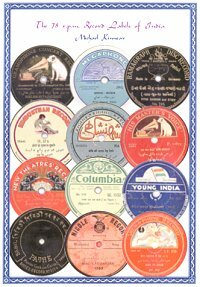 Mr Michael S Kinnear has now published a book: The 78 rpm record labels of India, from Australia. This book contains about 500 pages out of which 400 pages are devoted to the label details. Each page contains label photograph at top followed by useful information below such as the name of the company, proprietors, record numbers and series and a brief history of the recording company. Several colorful label illustrations have been included. Major companies mentioned are: Beka, Nicole, Pathe, James-Opera, Singer, Sun, Ramagraph, Odeon, Young India, Broadcast, The Twin, Columbia and of course HMV. Although we are familiar with the Dog and Horn label of HMV records, early labels contain birds and animals like a horse, tiger, elephant, cuckoo, sparrow, bulbul, heron, deer, swan, etc. Other labels have colorful designs with flowers and leaves. Early gramophone concert records contain an angel cutting grooves with a feather in his hand. The Broadcast label shows a diamond at the center and emerging out of sea waves like Sun, whereas the Sun record label of F B Thanawala shows a semicircle with SUN letters written at the center. The Saraswati Cinetone Record label shows the Goddess Saraswati playing a veena with a peacock sitting nearby. The Columbia label shows a tiger head whereas The Twin label shows twin heads of two children. Young India record company operated in Bombay from about 1935-55 and produced records with variety of colorful labels. Early Parbhat Film Company film songs records were made on this label and contained a small thumbnail photograph of the singer at top left rim of the label. V Shanataram was one of the promoters and when he formed Rajkamal Kala Mandir, some of his early film songs were too released on Young India label. Pandit Jawaharlal Nehru and Netaji Subhash Chandra Bose recorded messages for Indian on this label and their photographs have been published on the record labels. Apart from these HMV also produced records with photographs of Mahatma Gandhi, Rabindra Nath Tagore and Bhagat Kanwar Ram. This book is useful to record collectors and researchers and is dedicated to the oldest record dealer from Mumbai: the late Mr Bachoobhai Recordwala. The book is available from the publisher: Michael Kinnear, PO Box 11, Heidelberg, Victoria, Australia.